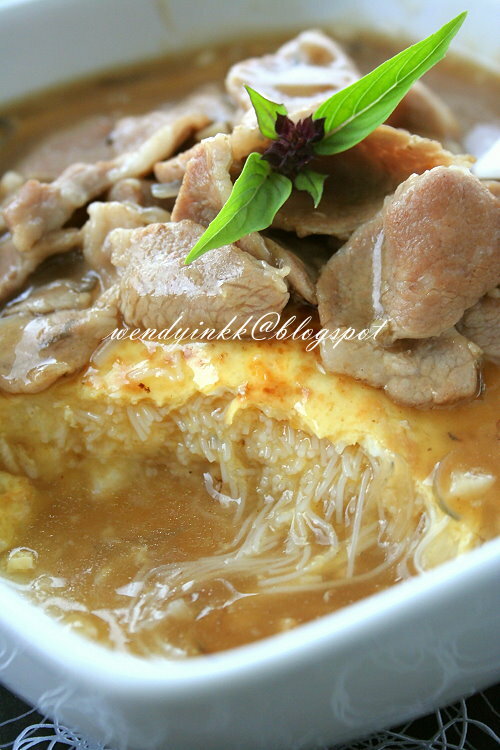 Rice noodles -can come with omelette or without. Both sides fried if without omelette. Plain, unseasoned. Taste: No sweetness detected, not peppery, more on the savoury side. Other thing to note: no vege, no spring onions, no specific chilli sauce, no ginger. So, for those of you who had this noodle before..... 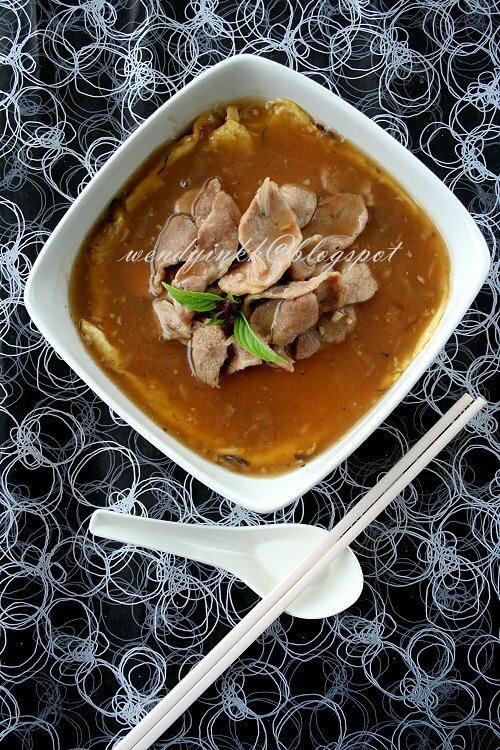 I hope you can try out my recipe and let me know if its smiliar or not, hahaha. But then again... different woks different chefs.... hard to get the exact taste right? We just try our best. 2. Mix gravy ingredients together. 3. Heat a wok on medium heat and beat the eggs. Put in 2 Tbsp of oil. Pour in the egg and let the egg spread on its own. Put drained rice vermicelli onto the egg and fry the egg until the base is golden. 4. 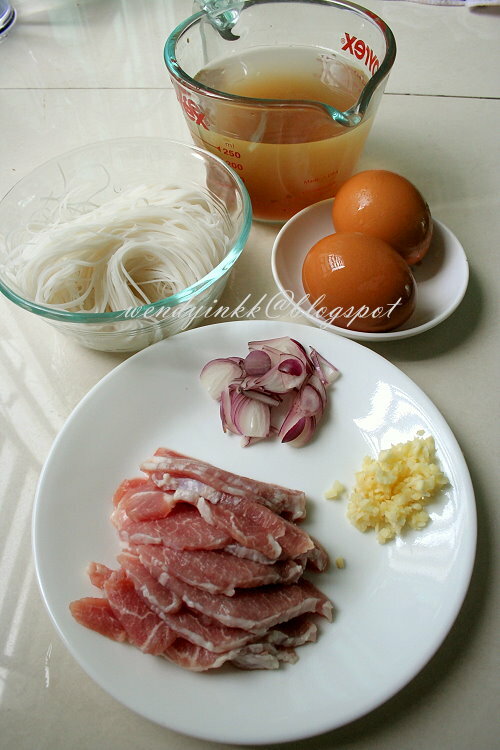 Flip the omelette and fry the other side with rice vermicelli until it takes on some colour. Dish up onto a deep serving dish, omelette side up. 5. Put in 1 Tbsp of oil and saute shallots first, then garlic. 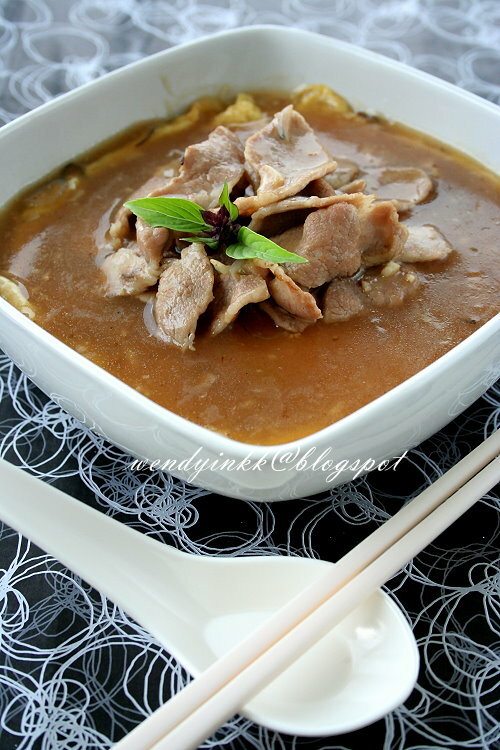 Add in pork slices and stir fry until the meat is nicely seared then pour in the prepared gravy. Bring it to a boil. Add more starch+ water to adjust to the consistency you prefer and adjust the taste too, make it very slightly oversalted (because the rice noodles are not seasoned). 6. Pour the pork gravy onto the omelette. I love your seasoned wok and spatula with no plastic handle! This is an interesting recipe. Bookmarking and thanks! Look very interesting & unique. Must be good with the burn smell! Hi Wendy, I tried this and we quite like it, fast and easy. The tricky part is I used seafood and threw in some greens like the way i saw it on another foodie blog by a Sabahan. Can submit to MFF? If the Sabahan says it's like that, then sure can. Maybe there are a few places in Sabah that sells this.